Apple iPhone has enabled many companies to bring their business on board and provide more value to iPhone owners. Smart companies such as Magellan have realized the potential that the iPhone business offers them, which is they have introduced their own apps for iPhone. 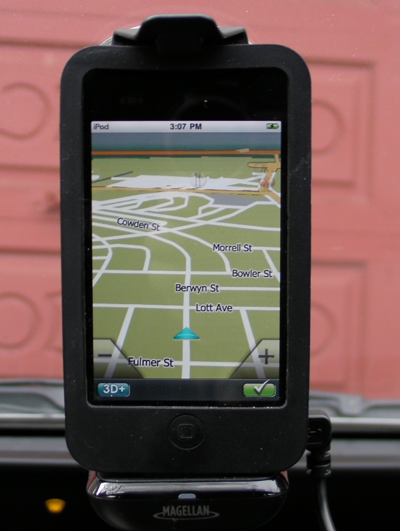 Magellan Roadmate 2010 is an innovative GPS application for iPhone that transform your iPhone into a super Magellan GPS. So you won’t have to worry about taking an additional gadget with you on the road only for navigation purposes. Magellan Roadmate 2010 comes with an interface that is very familiar for those who have used Magellan products in the past. 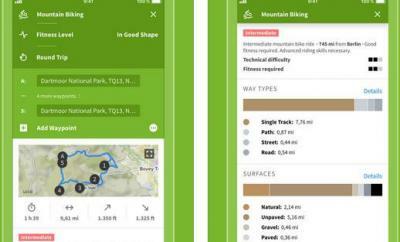 The interface is very intuitive, which means you don’t have to jump through hoops to find things to do in your GPS app. Adding destination addresses, customizing navigation features, and enjoying what your iPhone has to offer while navigating couldn’t be any easier. 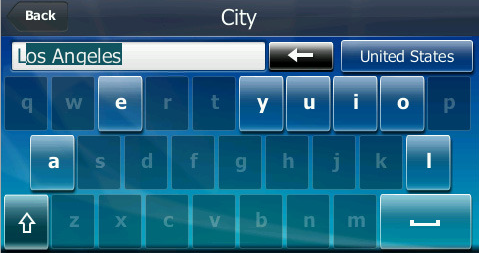 Magellan’s OneTouch Favorites Menu makes the process of choosing your destination and finding your way to it much easier. Just add your favorite places and let Magellan do the rest. The address book integration was very handy. You an navigate to your contacts’ information save on your iPhone with a touch of a button. I also liked the QuickSpell entry feature as it saves you time typing those long addresses on your phone. There are a lot of apps that come with decent looks but don’t deliver in the end. Magellan Roadmate is not one of those apps. It provides you with tons of features to stay on the right track on the road. Magellan’s algorithms are legendary. So you’ll never end up in no man’s land as long as you have Magellan on your iPhone. 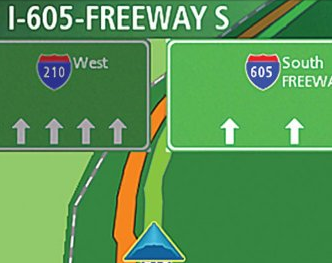 Thanks to Lane Assistance, you’ll stay on the right lane and get to your destination faster as well. 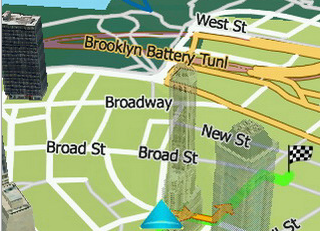 The 3D landmarks that you get with this app are useful as well. They certainly make navigating on your iPhone more realistic. The app comes with a Pedestrian mode as well, so you can get directions when you are on foot. You can even use the app to find your way back to your car (“Find Your Car” feature). We were provided with a copy to test Roadmate 2010. Magellan Roadmate 2010 is very strong when it comes to its navigation algorithm. The app can get you out of trouble without giving you “U-Turn” directions like some other apps though. The maps are up to date too. The app never crashed on us. So it’s pretty solid in that department as well. It does seem that the developers have put a lot of effort forward to ship this app bug free (unlike a few other top GPS apps). 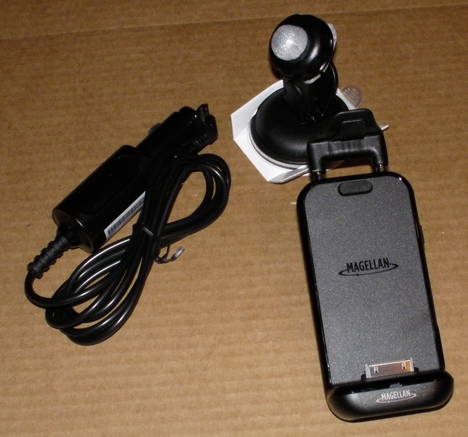 All in all, Magellan Roadmate 2010 is a powerful iPhone app that puts a lot of standalone GPS devices to shame. It’s not only accurate and easy-to-use, but it’s also ready for prime time from the get go. 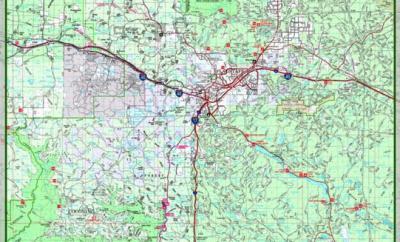 If you need a GPS, Roadmate 2010 is a good option to consider. The Magellan experience wouldn’t be complete without testing Magellan GPS kit for iPhone, which is why we had to test it to find out how good it is (thanks to Magellan for providing us with a review unit). The kit is designed for both iPod Touch and iPhone. Those who happen to own an iPhone can install the app and navigate on their phone on the go. But if you own a current generation iPod Touch, you are out of luck. That’s where Magellan Premium Car kit for iPhone comes in handy. 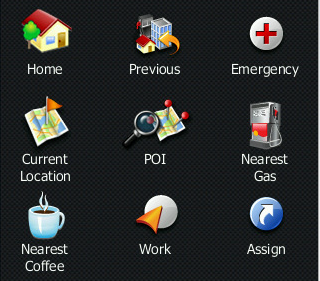 Not only it allows you to work with Magellan Roadmate 2010 on your iPod Touch, it also works with other GPS apps as well. 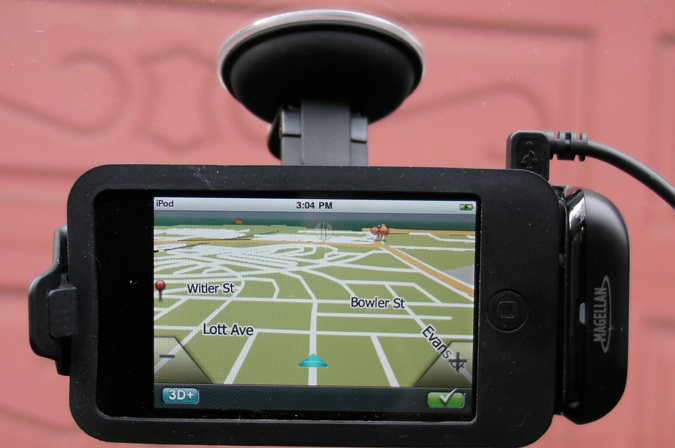 The kit comes with everything you need to transform your iPhone or iPod Touch into a GPS. You get a windshield mount, an adhesive disc, and auto adapter to keep your device charged on the go. The assembly is very straight forward, so you won’t even have to look at the guide to figure out how to put the mount together. The mount was more solid that I imagined. When you lock your phone in, it doesn’t move around, and you won’t have to worry about your device falling off when you are driving. I had a few concerns before testing this mount that turned out to be non-issues. The mount is flexible enough to let you mount your phone even when it’s inside a case (as long as it’s not too thick). I also thought that the connector could break easily. But that turned out not to be the case as it’s flexible and gives you room to maneuver. I used an iPod Touch to test this mount out to figure out what it’s really capable of. By my calculation, it took my iPod 5 seconds to get connected with the satellites and get my positioning. The voice instructions were what I expected and more. While a lot of GPS units on the market provide you with only one direction at a time, Magellan GPS sometimes provides you with more than that. So you know your immediate next steps (turns). The speaker’s sound quality was clear. You can always turn the sound up if you need it. The mount itself is pretty flexible. You can view your iPhone in portrait or landscape mode. The speakerphone can be quite handy as well if you want to go hands-free with your iPhone. 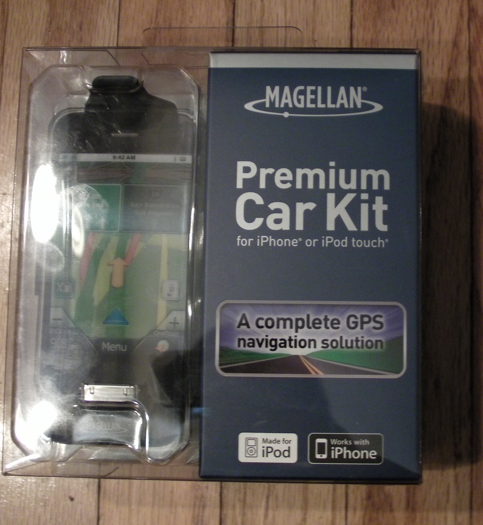 All in all, Magellan Premium Car Kit for iPhone is an all around solid accessory for any iPhone or iPod Touch owner. If you happen to own an iPod Touch and want to find out what you have been missing with all those navigation apps available on iTunes, Magellan Premium Car Kit is just what you need. I would have loved it if this GPS kit worked without the car adapter as well, but the price would have probably been higher. Considering the fact that this car kit makes it much easier to dump your old standalone GPS, it’s a good investment to make.